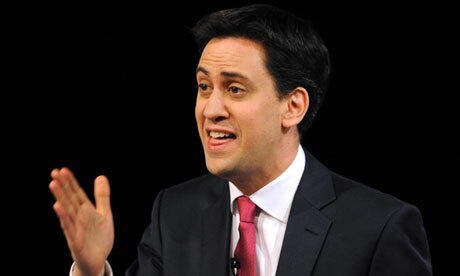 I know it is fashionable to laugh at Red Ed and patronisingly say he’s not that smart when it comes to economics. Except, he is VERY smart and was the Chancellor of the Exchequer’s right-hand man when he worked alongside Gordon Brown before 2008. It would be very trivial to suggest either Gordon Brown or Ed Miliband are stupid. Misguided, yes, and certainly socialists but they also have the requisite skills to create a socialist economy just not a free-market economy. But I think it has come to a point in the year 2013, where the debate between socialism and free-market economics is becoming redundant, just like the old Left versus Right arguments. I am a strident believer in capitalism, which is the foundation for free-markets, but in my view capitalism, in the UK at least, is broken and no longer serves the masses. We need reform. 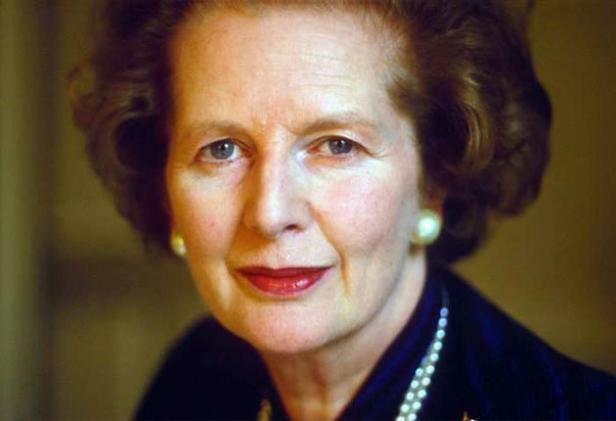 When Margaret Thatcher unleashed the power of the market during her reign in the 1980s it was abundantly clear socialism and 90% income tax rates were strangling ordinary workers financially and something had to be done. But once the blue touchpaper was lit it was very difficult to stop the subsequent chain reactions. Between 1985 and 2000 the good times were there for all to enjoy: privatised utilities gave shares to the masses (unlike the Royal Mail sale where most were locked out because of the £750 threshold), people were lifted out of the dirt (literally) in manual labour jobs and allowed to become bankers, IT consultants, small business owners because of mass deregulation and low taxes brought about by Thatcher’s chancellors. The babyboomer generation fell smack bang right in the middle of the economic boom and they have done extremely well. As I am reminded when I see the new Range Rover parked outside my house as a babyboomer tends to his cash-buy terrace house a few doors down in preparation for renting it out! But the wily boss class spotted an opportunity to get even richer and took control of the “free” market and since 2000, if not before in the 1990s, ordinary workers wages have been pushed down year-on-year. This does not just affect the unskilled and semi-skilled, but professionals in engineering, law and IT. Millions of people working in our biggest businesses haven’t had an above inflation pay rise for almost 15 years whereas the boss class have seen their salaries rocket, with it now unheard of for a CEO not to take home at least £1 Million in cash each year – before bonus, share options and their pension. The money is there. It’s just now all funnelled to the top. This is why I scratch my head when I hear the boss class say with a dreaded look on their face that if they are forced to pay their employees a living wage, prices will need to go up. I’m not convinced anymore when there is such a gulf in wages between the top and the bottom of an organisation. There is clearly money about but perhaps greed has got the better of those at the top. In the seventh largest economy on Earth, surely the private sector who create this wealth can afford to pay all employees enough so they don’t have to choose between eating and heating each winter? I will be accused of being economically illiterate. So be it. But when there is such disparity of wealth in one of the world’s richest countries, you have to question everything. When Labour brought in the Minimum Wage, the boss class said the world would end – except it didn’t. Labour’s Living Wage isn’t even as half as radical as the Minimum Wage with a tax break being offered to businesses who pay it. Categories: Politics | Tags: babyboomers, boss class, Capitalism, David Cameron, Ed Miliband, Free Markets, Labour, Living Wage, Margaret Thatcher, Minimum Wage, Socialism | Permalink. It was mid-week, a Wednesday and always a busy time at work. But I could not stay away from paying my respects to the greatest peacetime leader of the twentieth century. I travelled down to London early yesterday morning, taking up a spot in St Paul’s Churchyard with thousands of other mourners and supporters of Margaret Hilda Thatcher. 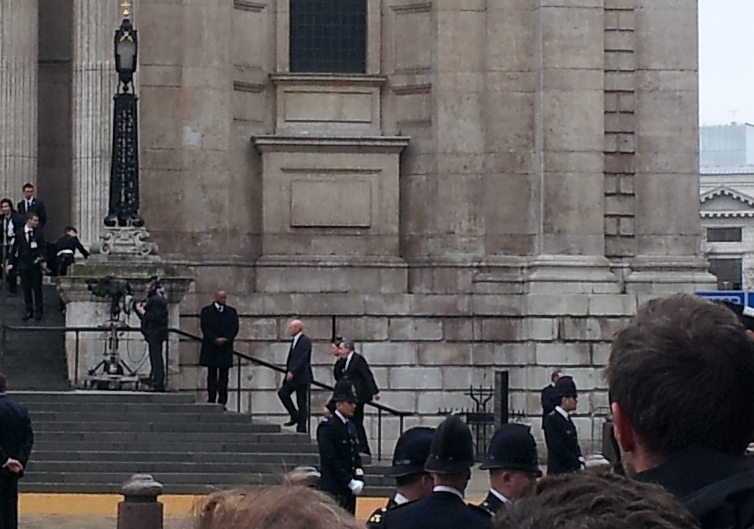 Whilst waiting for the funeral procession to arrive, the great and the good (and bad) arrived at the Cathedral. An amusing (and telling) moment was when former Labour prime minister Gordon Brown arrived and the crowd started booing and the paparazzi, stood on their step ladders behind me, shouted “Where’s our gold, Gordon?”. Brown swiftly scuttled into the church. Outside, the pageantry was incredible and, frankly, Great Britain does these types of events better than any other nation on Earth, by quite some distance. I will never forget the sounds and sights of this historic day. 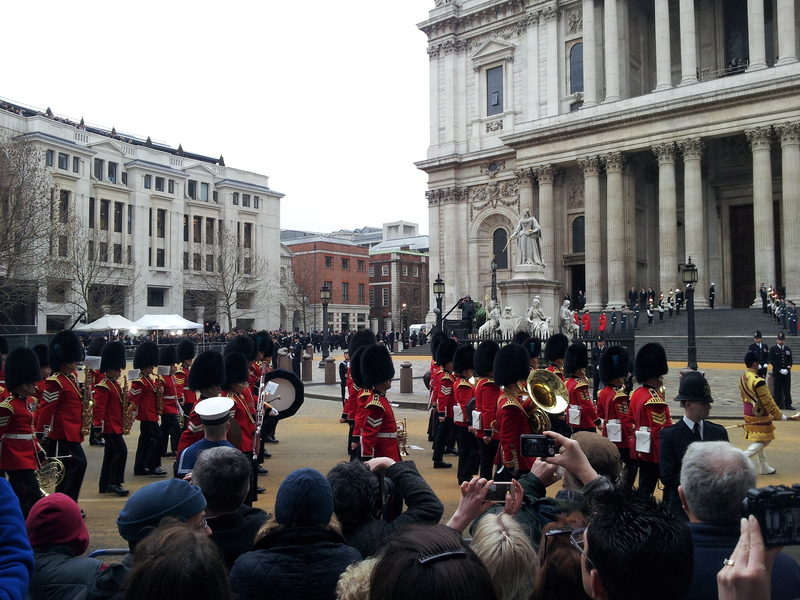 At twenty past ten, the 1st Battalion Welsh Guards in their deep-red tunics and bearskin hats marched to the front of St Paul’s Cathedral to form the Guard of Honour, then a single half-muffled bell of St Paul’s began to toll as the funeral procession started its descent up Ludgate Hill. We’ve had a lot of years of practice. When the procession arrived with Margaret Thatcher’s union jack draped coffin atop a gun carriage of the The King’s Troop Royal Horse Artillery, if it were not for the plethora of cameras, mobile phones and camcorders, the visual feast had not changed in hundreds of years. Baroness Thatcher’s funeral was on the same scale as the ceremonial funerals of Wellington, Nelson and Churchill and she deservedly ranks alongside these great figures from history. 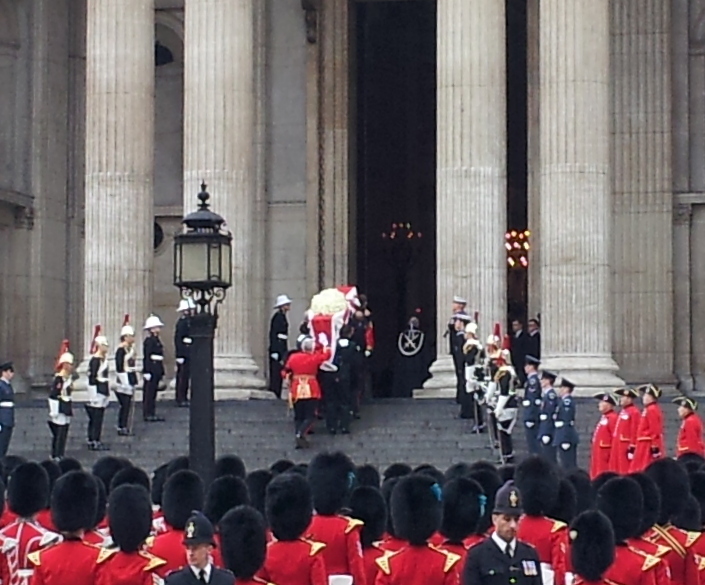 The presence of Her Majesty The Queen in St Paul’s Cathedral made this a State Funeral in all but name. 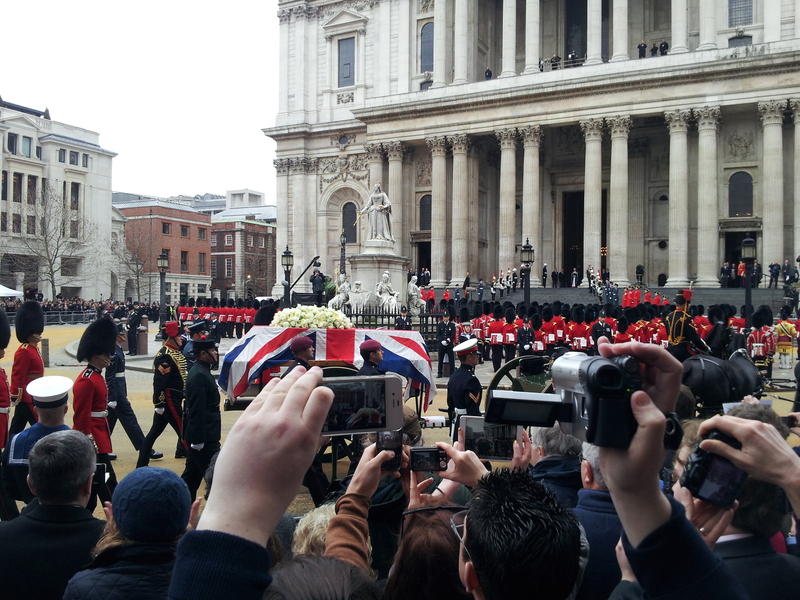 As Margaret Thatcher’s coffin came into view the crowds spontaneously applauded and cheered the Great Lady. The silent majority were heard. Thousands lined the streets with the crowds twelve-deep in places. No other prime minister since Churchill would garner this amount of respect. Some held placards simply saying “Thank you”. The fears of mass protests and even acts of violence did not materialise. Baroness Thatcher’s coffin was drawn to the steps of St Paul’s where it was then carried up to the West Door of the Cathedral by the bearer party made up of eight personnel from all three Armed Services, including those from ships, units and stations notable for their service during the Falklands War, when Mrs Thatcher ordered the fleet to set sail and liberate the Falkland Islands from the Argentine military junta. As her coffin, in perfect silence apart from the tolling of the bell, slipped into the Cathedral, I bowed and offered up a prayer for the greatest of ladies in the history of our country. The West Door was then shut and the funeral began inside for the family and invited guests. Margaret Thatcher’s leadership and her policies, which saved Great Britain and helped free millions from Communist slavery, will be discussed in 100, 200, 300 years time. It is not the end of Thatcherism but the beginning. She lives on in the much better world she created here and abroad and it is up to people like me and my fellow Thatcherites to carry forward her True Blue torch, which I intend to do, not just in words but in deeds too. Categories: Politics | Tags: Churchill, funeral, Great Lady, Margaret Thatcher, Nelson, Wellington | Permalink. It’s November 22nd 1990 and the Iron Lady has just been forced to resign by the Tory Toffs who decided to take “their” Party back. She then dutifully attends the House of Commons to respond to a vote of no confidence motion by the Labour Party, surrounded by the men in grey suits who betrayed her. And this is her response: a tour de force of political debating in the Mother of all Parliaments. For 23 years there has not been a leader like her and there is unlikely to be for a long time to come. Categories: Politics | Tags: Margaret Thatcher, Michael Carttis | Permalink. Talk to anyone who was living in Britain in the late 1970s and they will tell you this: our country was on the rocks, our European cousins across the channel sniggered we were the “sick man of Europe”, the dead were left unburied during the Winter of Discontent, the trade union barons ran the country enjoying beer and sandwiches in Number 10. Then came the election of the first female prime minister, Margaret Thatcher, in 1979 and the rot was stopped. But by the time she was ousted from office, she had done what she set out to do. Mrs Thatcher took Britain from being a basket case where the previous Labour Government had been forced to call in the IMF into the fourth largest economy on Earth by the time she left Downing Street after eleven years in 1990. Thatcher transformed Britain and no other peacetime prime minister has ever come close to securing such a lasting legacy. This very day, we only need to look around, and we can see her legacy. Privatisation of our public utility companies brought wealth through shareholdings to millions of people who had never had a stake in a company. I work for one such company – BT – and it is a far better run company for being publicly owned than it ever was as a State-run organisation. Back in the 1970s, owning a car and going abroad on holiday were still a luxury – today, many families have multiple cars and many more go abroad on holiday at least once a year! How do you think this happened? It didn’t magically occur. It was created by the economic reforms Margaret Thatcher, along with her trusted advisors like Keith Joseph and Willie Whitelaw, put in place. Mrs Thatcher unleashed an entrepreneurial revolution, removing regulation to help small businesses start up and thrive. The reforms in the City of London, notably the ‘Big Bang’ of 1986, made London’s financial services industry a rival to Wall Street and overnight brought down barriers to employment in the sector: out went the old-boys’ network, in came the ‘barrow boys’. Millions and millions of baby boomers today are living high on the hog because of Margaret Thatcher. I wish I was part of my parent’s generation rather than starting my career in the early noughties whilst Labour were taking a wrecking ball to the British economy once again. Back in the 1980s, Mrs Thatcher put the power back in the hands of the people and out of the hands of the elite trade union barons who until Maggie came along were quaffing beer and munching on sandwiches with THEIR Labour prime minister in Downing Street. Thatcher crushed the unions who had held an economic gun to the head of Britain for too long and because of parliamentary legislation she passed they will never be able to threaten our country’s economy again. Margaret Thatcher was not just a political heavyweight domestically but also internationally. When a military junta in Argentina invaded a small British sovereign territory, called the Falkland Islands, 8000 miles away from the UK, which most of the British population had never heard of, Thatcher did not flinch. Instead she ordered the fleet to sail for Port Stanley and, when there was not a large enough troop carrier available to the Ministry of Defence, she commandeered a cruise liner to ferry our troops to the South Atlantic. 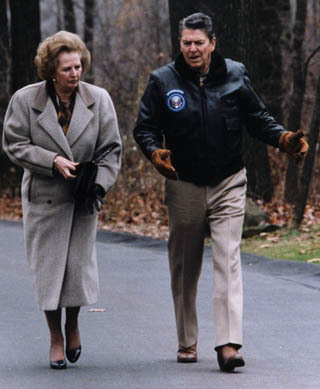 We now know Ronald Reagan, through the release of the Thatcher files under the Thirty-Year Rule, did not support her campaign to retake the Falkland Islands and he encouraged her to not “humiliate” the Argentines and to pull back. She refused and two weeks later the Union Jack was flying once again over the Governor’s House in Port Stanley. Then there was the Soviet Union. Red Star, a USSR propaganda sheet, dubbed her (even before she became Prime Minister) the Iron Lady for her strong will. She detested Socialism and Communism in all their forms. Thatcher saw millions of fellow Europeans trapped behind the Iron Curtain in countries like Hungary, Romania and Poland under oppressive regimes with their economies shattered. Together with Ronald Reagan, who adored her steadfast leadership style, they defeated Communism in Europe and ended the Cold War, allowing tens of millions of people to travel abroad and unleashing their talents into the global economy. In Hungary, high schools have a dedicated page in their history course books to only one UK prime minister: Margaret Thatcher. Unlike the British Conservative Party leadership of today, Margaret Thatcher did understand the aspiring class. She was the daughter of a green grocer who worked her way up and, granted, through the love of her husband Denis, his wealth allowed her to leave her trades of Chemistry and the Law to become Conservative Party Leader and then prime minister in 1979. But she never forgot where she came from and instinctively understood people who were thriving and trying to get on. Maggie always knew the price of a pint of milk! 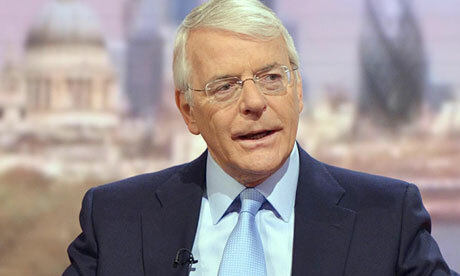 Margaret Thatcher was a major national and international figure, whatever your politics. She ranks alongside Wellington, Palmerston, Gladstone and Churchill. Unlike them she ordered before her death that she did not want her body to lie in State and therefore she will not have a State Funeral but will be afforded a Ceremonial Funeral in St Paul’s Cathedral with full military honours. It will be the same form of funeral as the Queen Mother in 2002. This is entirely fitting for a woman who was one of the greatest world leaders of the Twentieth Century. As the current Prime Minister David Cameron said on this sad day, Margaret Thatcher “saved” our country. Frankly, she put the Great back in to Great Britain. May this great lady rest in peace. 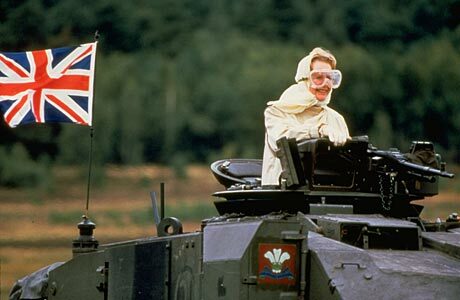 Categories: Politics | Tags: Great Britain, Iron Lady, Margaret Thatcher, Prime Minister, tribute | Permalink. 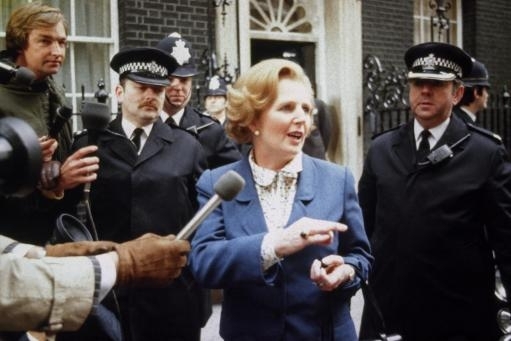 Britain’s longest serving Prime Minister, first female PM, and the ‘Iron Lady’, as the former Soviet Union dubbed her, has sadly passed away today, aged 87. 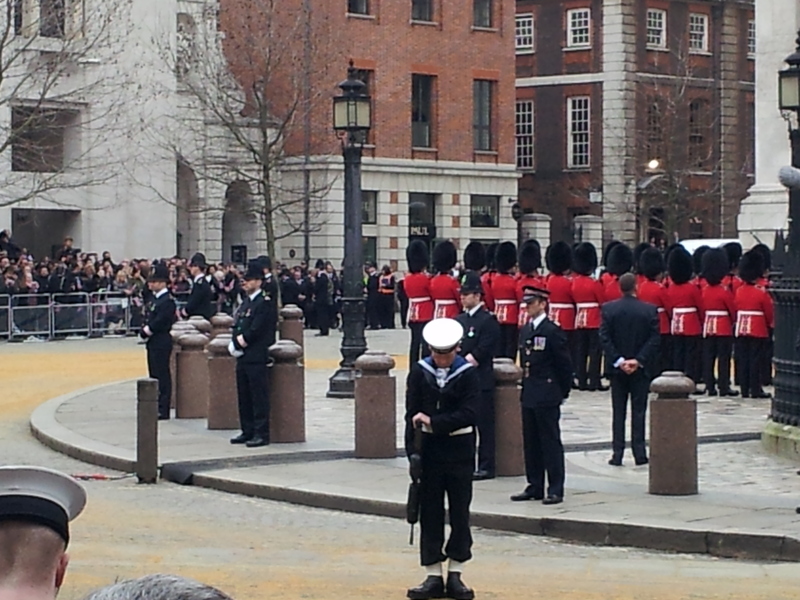 Margaret Thatcher will be given a Ceremonial Funeral with military honours at St Paul’s Cathedral, London. Flags have been lowered to half mast this afternoon in Downing Street. 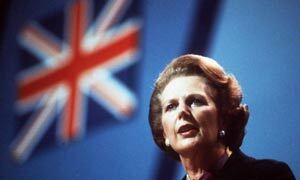 Categories: Politics | Tags: Great Britain, Margaret Thatcher, political giant, Prime Minister | Permalink.